On Saturday, 2/17, the Varsity Basketball Team (19-3) hosted Hoosac on Senior Night. NYMA won by the score of 80-38 and was led by Will Mayfield who scored 17 points. The Knights also got solid contributions from Zaahir Woody and Zamere McKenzie who scored 16 points each. Branden Evans finished with 12 points while Nigel Petti-Fernandez had 7 and Josh Antoine had 6. For photos of the game, please visit: Facebook Album: Basketball vs Hoosac. On Wednesday, 2/21, Varsity Basketball (20-3) hosted Poughkeepsie Day School in a HVAL Semifinal matchup. NYMA won by the score of 70-37 and was led by Zaahir Woody who had 31 points, 12 rebounds, and 10 assists. The Knights also received strong performances from Karif Isaacs with 13 points, Branden Evans with 12, Nigel Petti-Fernandez with 12 (career high), and David Pinto-Ricardo who grabbed 12 rebounds. The JV Basketball Team was also home on Wednesday. They hosted the Woodhall School. NYMA lost by the score of 34-51. Andrew Weng scored 17 points while Ethan Hassane had 11. The JV Team has home games this Saturday and Sunday against Marvelwood (1:30 pm) and Woodstock (2:30 pm). This will conclude the junior varsity basketball season. On Wednesday the NYMA Wrestling Team traveled to Storm King for a scrimmage and won 5-2 overall. It was a great match for the guys and an incredible way to end their season. To watch a quick video from the meet, please visit: Facebook Video: NYMA Wrestling. The team will continue to train with Coach Roselli for the next couple of weeks until spring sports start. The future of NYMA Wrestling is bright as everyone on the team will be returning next year! The Bowling Team had a tough outing on Wednesday as they dropped both matches to Storm King and Faith Christian Academy. Heidi Wash had a solid day and continues to improve each week for our young team. 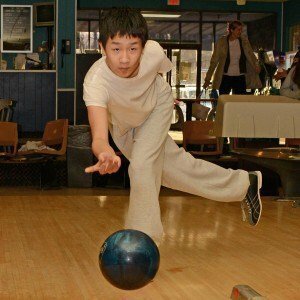 Senior Simon Lin also bowled well for the Knights. The team will conclude their season next Wednesday at Pat Tarsio Lanes where they hope to rally and move up to second place.